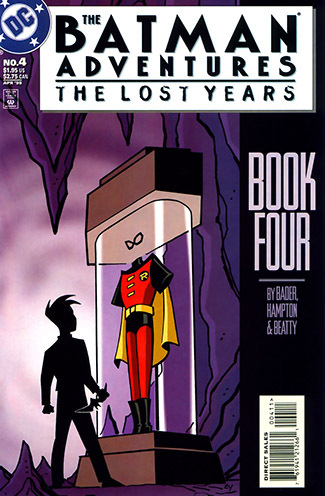 IN THIS ONE... Tim Drake's story before he became Robin. CREDITS: Written by Hillary J. Bader; art by Bo Hampton and Terry Beatty. REVIEW: Have they already expended the "lost years" that they're already using material from the show itself? 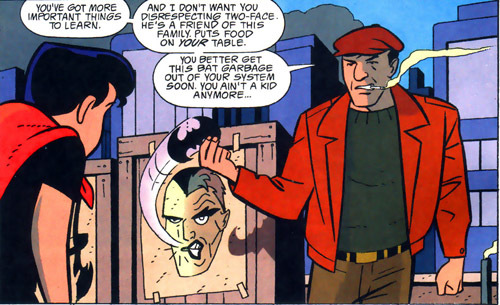 I mean, we see how Tim Drake got his hand on a batarang, how he practiced with it, and his relationship with his father, one of Two-Face's henchmen (which was much discussed in Tim's introductory episode). By page 11, we're rehashing "Sins of the Father" wholesale. Despite some added lines - and in particular, Tim's attachment to that one batarang - it really feels like we're only getting half an issue. So let's talk about that half-issue, because it really does fill out Tim's character, how he's a good kid whose role model is Batman, a hero he desperately wants the father he loves to be more like. In his spare time, he fights injustice on the school bully level, and resists his father's bleak world view. Shifty Drake is a good dad, but he's largely given up on life. He doesn't think he has a choice, and that neither has his son. But maybe, just maybe, he allows for it. These pages are full of Tim's resilience and self-reliance, and you better understand why he should become the next Robin than what was afforded in "Sins of the Father". But is it enough? REREADABILITY: Medium-Low - It isn't that it's not well told, it's that for the most part, the DCAU has already told it. At the time, the choice was between the character fans hated so much, they phoned in to kill him, or the new kid who was helming his own series. I wouldn't have needed a mandate, personally. I get that, but then why make the kid's origin so much more like Jason's than Tim's? Did they think that "good kid who works out who Batman is and then decides to become Robin in order to keep the Dark Knight balanced" is a hard sell in a 22 minute cartoon? DCAU #233: Destroy the JLA! DCAU #232: All Hellgrammite Breaks Loose!